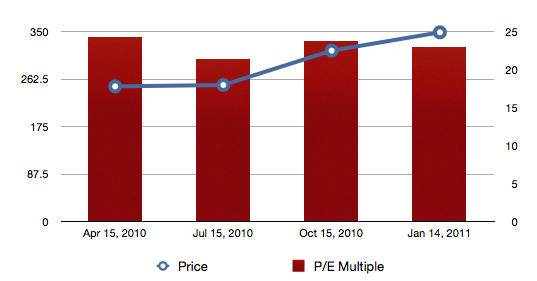 On November 14, 2010 I published my most recent AAPL price forecasts and price targets. In that post I set a share price target of $363 for February 1, 2011 with a forecast price range of $346 to $380. On Friday, January 14, 2011, AAPL closed at $348.48 per share, in anticipation of strong December quarter results to be released on Tuesday. At Friday's closing price AAPL is trading at 23 times trailing 12-month earnings. This multiple foreshadows a strong December quarter performance and the market's response to this week's announcement the iPhone will soon be available in the US on the Verizon network. In preparing for revisions to my price forecasts and targets to be published soon after the release of the December quarter results next week, I researched the price-earnings multiples for AAPL just prior to and soon after the public release of quarterly earnings reports for the most recent quarterly periods. The data suggests no matter the recent rise in Apple's share price over the past few weeks, there's room for the share price to run following the release of December quarter results on Tuesday. The table data and graph below indicate the closing share price and price-earnings multiple on the 15th of the month and within a week of the release of quarterly earnings reports for the most recent four fiscal quarters. Apple's Friday price-earnings multiple of 23 times trailing earnings is within the range of recent multiples ahead of earnings releases. As an independent analyst I rely heavily on historical data in developing estimates of Apple's future performance. In an October blog post titled Apple's FY2010: A Retrospective I looked at the revenue contributions of each of the company's major product lines. Today I'm publishing in table and graph form the unit sales for the Mac, iPhone and iPod product lines for the most recent twelve fiscal quarters, from FQ1 2008 through FQ4 2010. The numbers are published with little need for analysis. The graphs are each worth 1,000 words. I will be updating my CY 2011 AAPL Price Target and Price Forecasts following the release of FQ1 2011 results on January 18th. In the meantime, the table data and graphs in this blog post illustrate Apple's foundation for continuing growth. In FY 2011 (ending in September), I expect Apple to report over $100 billion in revenue and earnings per share at or above $25. Apple's foundation for strong revenue and earnings growth isn't built on any one product line. Although the Apple iPhone and the Apple iPad will generated more than 50% of the company's revenue this fiscal year, each of the company's major revenue segments materially impact overall results. While much attention has been placed on the Apple iPhone and Apple iPad, the Macintosh line of personal computers continues to contribute heavily to the company's overall results. In FY2010 the Macintosh line represented 27% of the company's reported revenue and in the fiscal year unit sales rose 31%. In FY2011 I expect the Mac's strong unit sales growth to continue and for the line to represent roughly 20% of the company's reported revenue for the fiscal year. As an independent analyst and moderator of the Apple Finance Board I enjoy the opportunity to prepare estimates of Apple's anticipated performance on a quarterly basis. My estimates rely heavily on Apple's recent quarterly results and I actively track trends that emerge over the most recent eight-quarter periods. For more information on the quarterly data I compile and the results I track, please see the Posts At Eventide Resource Guide for Independent AAPL Analysts. For the December quarter my models forecast revenue of $26.425 billion and earnings per share of $6.27. This represents anticipated revenue growth of 68% over the prior-year period and eps growth of 70.8%. I expect eps growth to slightly exceed revenue growth in the quarter due to lower tax rates and a drop in operating expenses relative to revenue. For a comparison of the rates of growth in Apple's revenue and operating expenses, please see my recent blog post titled Apple: Revenue Growth vs. Growth in Operating Expenses. The drop in tax rates and the drop in operating expenses relative to revenue will mitigate the impact of lower gross margins in the quarter versus the prior-year period. Apple has become more aggressive on product pricing relative to manufacturing costs. It's my view the moderation in gross margins seen in FY2010 and expected in the December quarter is intended to gain market share through higher unit sales and promote growth in post-purchase revenue from the sales of apps and digital content. The more units sold, the greater the growth in post-purchase revenue. In late October I published blog post titled Apple's FY2010: A Retrospective. In that post I illustrated the contributions of each of Apple's revenue segments to the company's overall results. 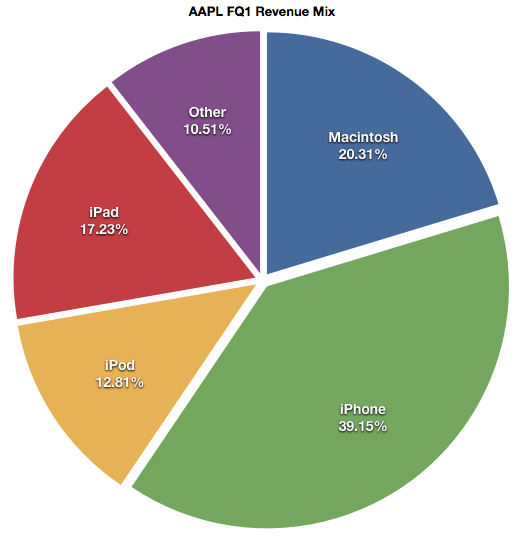 In the December quarter and throughout FY2011 the Apple iPad will continue to dramatically change the percentage of revenue contributions from each of Apple's major product lines. I estimate in the December quarter the Apple iPad will represent about 17% of Apple's reported revenue and represent almost 42% of the quarter's estimated growth in revenue.